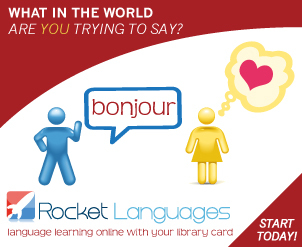 Rocket Languages is an award-winning, interactive online language learning program. The program allows users to learn conversational language at their own pace with access from anywhere and downloadable lessons that makes for easy access on all MP3 compatible devices. Rocket Languages is also available as a free App for Android and iOS devices so you can learn languages on the go. Just search your favourite app store for Rocket Languages. All you need is your library card to start learning a new language! The cost of this public library service was generously provided by a grant received from the Municipality of Pictou County.